Description: A generation ago, the city of Voortyashtan was the stronghold of the god of war and death, the birthplace of fearsome supernatural sentinels who killed and subjugated millions. So it makes perfect sense that General Turyin Mulaghesh — foul-mouthed hero of the battle of Bulikov, rumored war criminal, ally of an embattled Prime Minister — has been exiled there to count down the days until she can draw her pension and be forgotten. The truth is that the general has been pressed into service one last time, dispatched to investigate a discovery. For while the city’s god is most certainly dead, something is awakening in Voortyashtan. And someone is determined to make the world tremble at the the city’s awful power again. 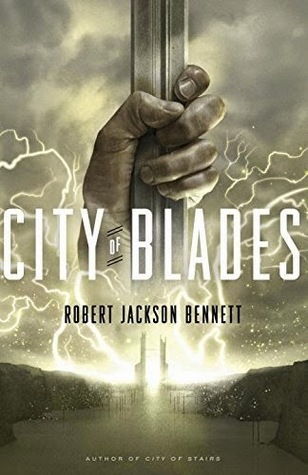 But Robert Jackson Bennett did not address my biggest gripe with City of Stairs in its sequel. My biggest gripe was the hopelessness of City of Stairs. Allow me to clarify. City of Stairs was a ‘serious book for serious people’ sort of book. All the characters were intense. There was no humor to speak of, no innocence, no hope for a better future. It was very much a ‘we are stuck in the mud together and I’m going to drag you deeper into said mud’ sort of book. ‘City of Blades’ was more of the same. By and large I did not feel empathy for the characters in this book (and the previous book). They’re fantastic characters for the most part, but in the end they lacked softness enough for me to feel empathy with their ultimate fate. I the reader was not invested into the good guys winning and the bad guys losing. This book was too grimdark for my taste. This book was all medicine and no candy, and sometimes you need candy to make the medicine go down. City of Blades discussed issues such as PTSD, colonialism and racism- you’ve been warned if you read it. Characterization: Robert Jackson Bennett’s characters are very good. All of them are well fleshed out, having realistic responses to situations that they perceive. I’ve already noted that the characters here are unrealistically uniform in the fact that none of them are optimistic at all, but besides that all the characters are fun to read about. Also, Mulagesh is AWESOME throughout. Plot: I think the plot was better in this book than the last one. The conspiracy in this book was much smaller than the last one, which was a welcome change after the ‘illuminati’ syndrome present of the last book. Instead the conspiracy here simply triggered events which spiraled out of control thanks to human flaws in the various characters. If I was to make constructive criticism about this point, it would be to say that the author relies too much on conspiracy theories to further his plots. That (hopefully) is an adjustment he can make in future books. Pacing: throughout the book the pacing was very well done. I can’t remember a point where it drags, and I was gripped to finish the book from the 66% point onward. There were no loose ends, and everything was well foreshadowed and in ways that don’t hit you over the head with said foreshadowing. Highly recommended, but be sure you are in the mood for an urban fantasy grimdark thriller. This book is a THRILLER above all else, so be prepared for that.